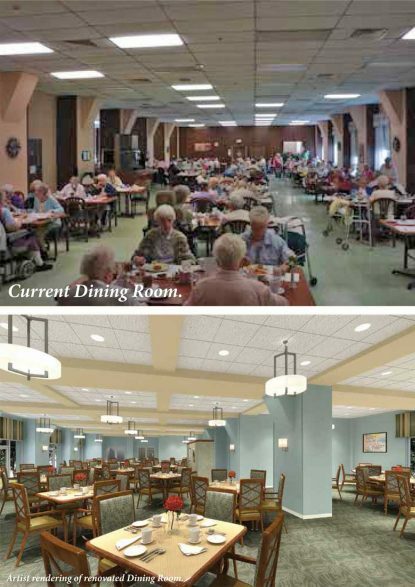 This photo shows the current dining hall of St. Joseph Villa at top, and what it will look like after the renovation is complete, at bottom. The Sisters of St. Joseph of Chestnut Hill this month announced the award of a $350,000 grant from the Connelly Foundation toward the renovation of St. Joseph Villa in Flourtown, the home for retired and ill sisters of the congregation. 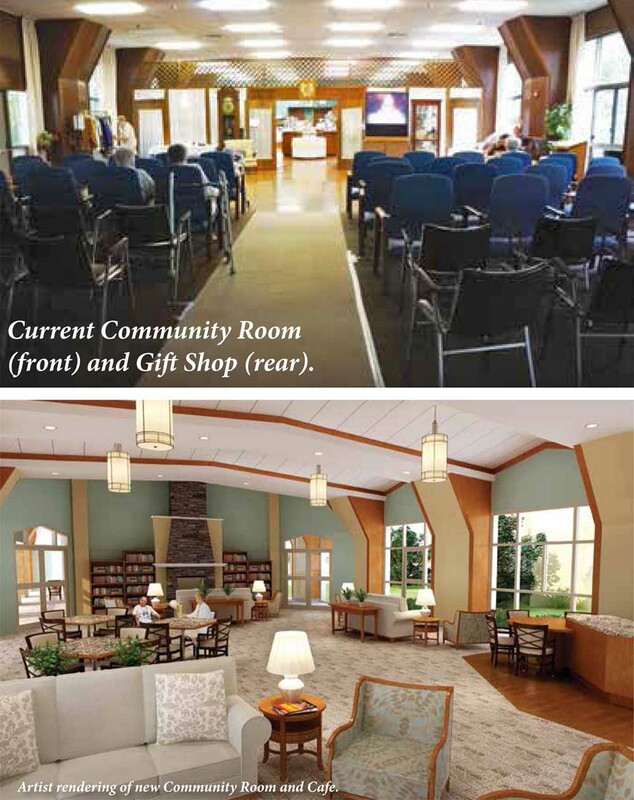 The model for care in nursing homes and assisted-living facilities has shifted from the traditional institutional approach to a more home-like, community-based model, and the renovations at St. Joseph Villa will adopt this model. The focus gives residents more control over their daily lives, in accordance with their wishes. The project will create 12 neighborhoods in the facility, two on each floor, that include community space designed to encourage residents to spend less time in their rooms and more time with others in the renovated space. The new space includes a country kitchen, dining area and living room that fosters socialization of the residents. The Connelly Foundation grant will be directed toward the construction of one neighborhood. “We are most grateful for the many ways the Connelly Foundation has supported our sisters in the past and today,” said Sister Dorothy Apprich, S.S.J., St. Joseph Villa’s executive director. The current community room at St. Joseph Villa is shown at top, with the proposed community room below. According to information on the sisters’ website, projected costs for the renovation total $25 million. The villa was built in 1968, and many of its features need to be replaced. At the same time, the congregation expects the need for services to elderly and infirm sisters, plus other residents, to grow over the next 20 years. The congregation has approximately 835 members, of whom the median age is 74 years. “Our experience of living our mission through prayer, community life and ministry has changed greatly over the years. Our sisters coming to live at the Villa today have very different expectations, needs and desires than in the past. Our goal is to create an environment of home/community in which our residents want to live and, by having the supportive services they need, will continue to live life to the full,” said Sister Dorothy. St. Joseph Villa serves not only retired Sisters of St. Joseph who experience community life in an assisted living setting on the fourth through seventh floors, but it also includes both lay men and women, as well as sisters on two skilled care floors, the second and third. More information about the St. Joseph Villa Renewal and Revitalization Project is on the congregation’s website. This is wonderful. The sisters certainly deserve it. Two of my Aunts were Sisters of St. Joseph and all at the Villa took care of my mother. What a difference this will make, so bright, so cozy looking.